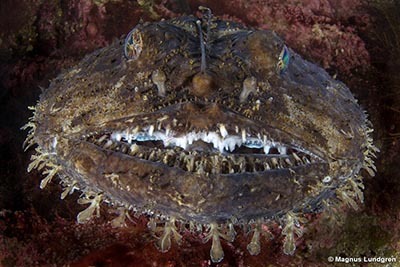 We invite you to the ocean’s weird, ugly and downright horrifying creatures. Some may appear small and somewhat cute, however, don’t let their small physique fool you – most of them deliver powerful and excruciatingly painful bites, or are otherwise just plain ugly. Welcome to nature’s own freak show. (Let’s all appreciate the fact that some of them live in deep water). You definitely would not want to stir this froggy-looking ocean dweller! 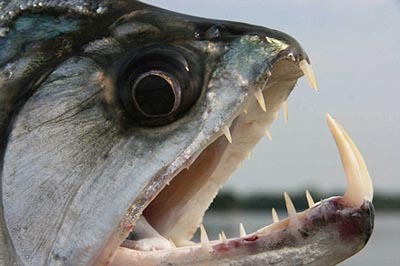 Although it may appear to be somewhat harmless (and maybe even slightly endearing), it will aggressively take a bite out of prey much larger than itself. Cheeky and dangerous by nature, this creature lies flat against rocks, camouflaged, waiting to take a lunge at passers-by. No that’s not a mound of rotting flesh floating in the distance, it is the head of the monkfish. Gross! These grotesque looking fish carry extra flappy skin on their heads to use as bait when luring prey, which they snap up and swallow whole. We wonder, do they even taste their food? Here you go, this is what nightmares are made of. 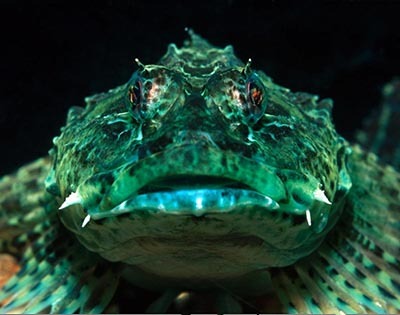 Maybe Hollywood should create a movie about these obscure-looking fish instead of a Jaws sequel. 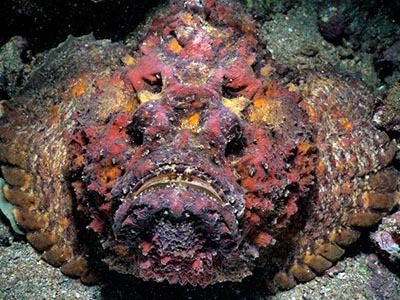 Not only are stonefish terrifying to look at, they are also dangerous to humans – they are one of the most venomous fish in the ocean. These fish are absolutely ravenous – for you. Think sharks are terrifying because of their large stature and pointy-sharp teeth? These little gnashers are unrelentless and will gnaw their way through any animal they may encounter which includes large animals and humans – and they just don’t let go. Best keep those toes out the water. 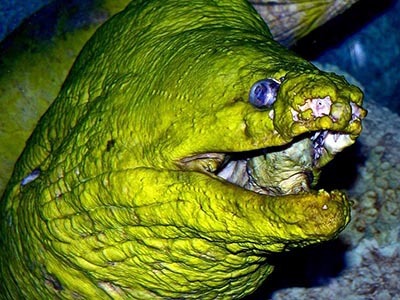 Sinister-looking moray eels have that “I am up to no good” attitude about them – maybe it’s because they swim with their mouths ajar baring their razor-like fangs for all the ocean’s residents to see. Swimming with their mouths open isn’t a test of endurance, they are in fact blind and use this as a hunting technique. Some say beauty is in the eye of the beholder, but unfortunately for the fangtooth fish, it will make the softest hearts turn stone cold. 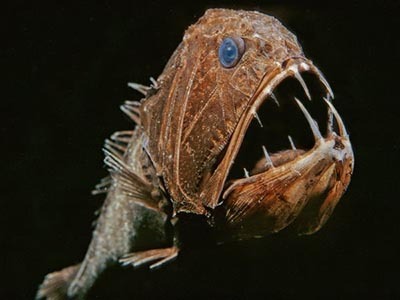 This frightening fish received its vampiric name due to the fact that it has the largest teeth out of any other animal in the ocean according to body proportion. Definitely the ogre of the ocean, let’s call it the ogrefish from now on. Danger factor: Who cares, no one would want to come near such a thing (and it lives in really deep waters –where it should always stay). Ol’ Mr Grumpy here has nothing to smile about since being named the world’s ugliest animal (shame). 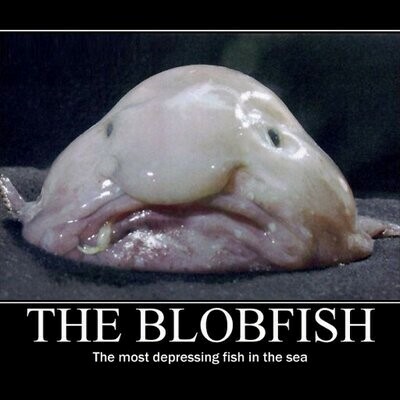 The sad and lonesome blobfish can be found listless on the ocean’s floor lazily waiting with its mouth open for food to swim right in. Adding another blow to the blobfish’s esteem, this tub of gloop is as dangerous as… a quivering bowl of jelly. Are your eyes watering at the sight of these terrifying sea creeps? Refresh your mind, breathe in the fresh sea air and witness one of the greatest (and best-looking) predators of the ocean during a day of shark cage diving.